Have teeth coated with dental sealant. Typically used to prevent tooth decay in permanent teeth, it is now being used more and more by pediatric dentists to protect precious baby teeth as well. In as little as a few minutes, a thin, durable barrier can be applied to the pitted surfaces of your child’s teeth to keep harmful bacteria from doing lasting damage. Since sealant is invisible to the unpracticed eye, your child won’t even notice it’s there. 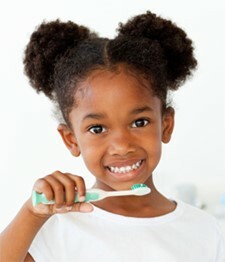 Do another round of brushing when your child is asleep. It can take time for your child to adopt good dental habits, but it doesn’t take long for plaque to do a number on teeth and gums. On days you think your child’s teeth could be cleaner, it can be worthwhile to simply wait until after bedtime for a second, more thorough sweep of the teeth. Waiting until your child is sleeping deeply can minimize the chance of waking him or her while you brush. Keep Xylitol wipes handy for quick late-night cleanings. Use disclosing tablets to detect plaque buildup. An easy way to monitor your child’s oral health in between dentist visits is through disclosing tablets — colored chewables that use harmless dye to reveal areas where plaque is forming. Having your child use this regularly can be an effective way to ensure teeth are being thoroughly cleaned, so that you can make any necessary hygiene adjustments before cavities form. Check with your dentist for a recommended brand, and find these at your local drugstore or online. Add fluoride to your child’s diet. Fluoride, a naturally occurring mineral, is a proven cavity-fighter that can prevent and even reverse early tooth decay. The ADA recommends daily intake of moderate levels of fluoride, and it can easily be incorporated in a variety of ways: through fluoride-enhanced water, vitamins, toothpaste and more. Check with your child’s dentist first to ensure the proper dosage for your child. Encourage a drink of water after a sweet treat. A little H2O right after dessert can do more than just quench your child’s thirst. Not only does it help minimize the contact of sugar with his or her teeth, but also it can dislodge tough food particles and help restore the mouth’s PH balance. Cleansing the palate by drinking water (and brushing, if possible) can also diminish cravings for more sweets. Dish up a plate of food before going to a party. If you know your child is headed for a celebration, have him or her eat just beforehand. Offering a plate of nutritious food can help fill your child’s stomach and make a cavity-causing cake and dessert binge less likely. Setting a rule on edible favors can also help limit sweets without cutting down on the fun of the event. Permit your child to pick out a few favorites and save (or share) the rest. Taking a creative approach can make dental care less stressful for both you and your child, but regular brushing, flossing and dentist visits are still the most critical paths to preserving oral health. For additional questions or ideas on protecting your child’s teeth, schedule a consultation with your child’s dentist.